Quest Crew recognized for best choreography. The reference was to an Asian exchange student played by Gedde Watanabe in 1984 teen comedy “Sixteen Candles.” The character was denounced as a racial stereotype by Asian American watchdog groups. “So we got a long way to go, but I know we can get there,” Yang continued. “I believe in us. It’s just gonna take a lot of hard work. 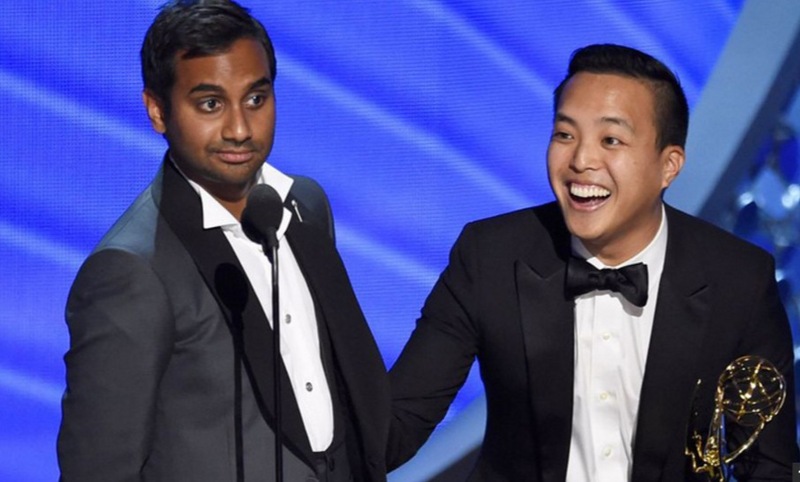 “Master of None” stars Ansari as Dev Shah, a commercial actor who tries to make his way through life in New York City. The cast also includes Kelvin Yu as Dev’s friend Brian Cheng. 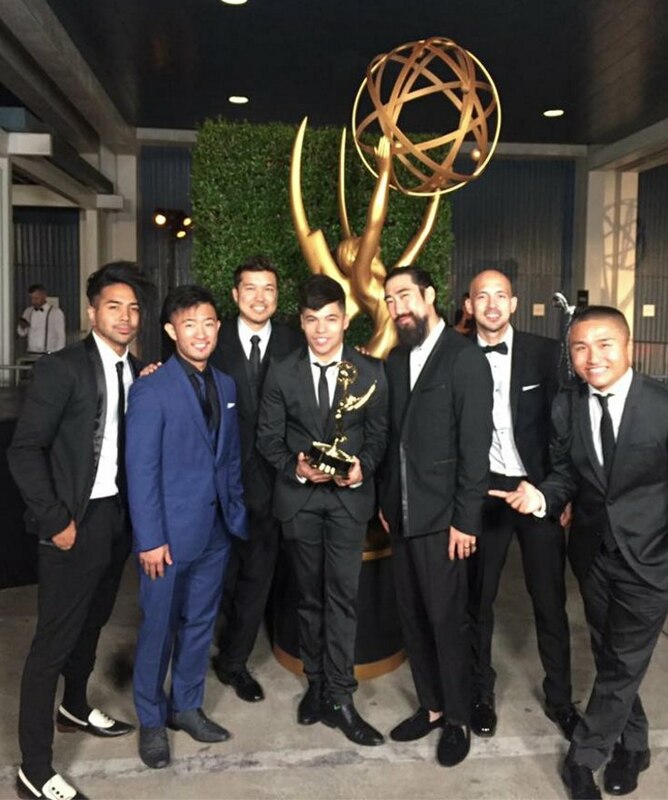 From left: Ryanimay Conferido, Steve Terada, Brian Hirano, Dominic Sandoval, Ryan Feng, Joseph Lee and Hokuto Konishi of Quest Crew celebrate their Emmy win. Quest Crew is an Asian American group named for the Quest Learning Center in Artesia. Members featured on Season 8 of “America’s Best Dance Crew” were Hokuto “Hok” Konishi, Steve “Dope Turtle” Terada, Daniel Ryan “Ryanimay” Conferido, Dominic “D-Trix” Sandoval, Brian “Hirano” Hirano, Ryan “Feng” Feng, Rudy “Ru” Reynon II, Aris “FreakinAris” Paracuelles, and Joe “Joleethal” Lee. Their Emmy-winning performance was titled “The Bench,” a reference to the fact that their time together as professional dancers is limited. Burns won for a number titled “A Boy Band Made Up of Four Joshes,” in which “Crazy Ex-Girlfriend” co-star Vincent Rodriguez III danced as four versions of his character through the magic of special visual effects. Outstanding Sound Editing for a Nonfiction Program (Single or Multi-camera) — Joanna Fang, sound editor, “Cartel Land” (winner). Outstanding Single-Camera Picture Editing for a Limited Series or Movie — C. Chi-Yoon Chung, editor, “The Race Card,” an episode of “The People v. O.J. Simpson: American Crime Story” (winner). Outstanding Technical Direction, Camerawork, Video Control for a Limited Series, Movie or Special — Kai-Lai Wong, senior video control, and Ernie Jew, camera, “69th Annual Tony Awards”; Ernie Jew, camera, “Adele Live in New York City”; Easter Xua, camera, and Terrance Ho, video control, “The Oscars”; Easter Xua, camera, “Grease: Live” (winner). Outstanding Structured Reality Program — Dennis Kwong, producer, “MythBusters”; Kate Ryu, senior producer, “Shark Tank” (winner). Outstanding Costumes for a Contemporary Series, Limited Series or Movie — Helen Huang, assistant costume designer, “American Horror Story: Hotel” (winner).